Since 2013, the Venezuelan people have lived under the brutal and exceedingly authoritarian rule of Nicolás Maduro. Consumer prices in Venezuela have increased exponentially in recent years, making basic necessities such as food and medicine unaffordable for many citizens. As a result, 2.3 million migrants have fled the country since 2014, and in 2017, studies found that 75% of the population had lost an average of 19 pounds of weight due to food shortages and price hikes. In addition to the economic crisis, Maduro has taken widely unpopular steps to consolidate power through constitutional reform backed by a loyal Supreme Court. Venezuelans have largely opposed these moves toward authoritarian rule, and protests in 2017 were met with violence and repression, killing over 100 people. Notably, in September 2018, well before the current crisis, Argentina, Canada, Chile, Colombia, Paraguay and Peru referred the situation to the International Criminal Court (ICC). On January 5, 2019, Juan Guaidó was elected President of the National Assembly, and on January 23, after invoking articles 233 and 333 of the Venezuelan constitution, took the presidential oath. The articles of the constitution, as interpreted by the opposition, allow for Guaidó to serve as president until elections are called. Nicolás Maduro, who is backed by the military and judiciary, considers this claim illegitimate. The international community is divided on the crisis, with Russia, China, Iran, Mexico, Uruguay, and Cuba supporting Maduro’s rule, and the majority of South American countries, the U.S., Canada, and now ten EU countries supporting Juan Guaidó. Within the U.S., communities are also divided on next steps. As an organization committed to atrocity prevention and civilian protection, STAND remains deeply concerned about violence against protesters, crackdowns on dissent, and the ongoing humanitarian crisis. 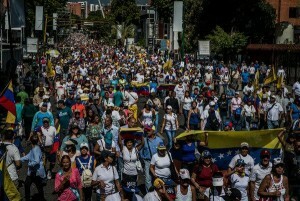 We stand in solidarity with the people of Venezuela, who overwhelmingly oppose military intervention, but are calling for free and fair elections. We support humanitarian assistance in the form of food and medical aid, an increase in US resettlement of refugees from Venezuela, and an ICC investigation into human rights abuses. Absent political dialogue and a tangible timeline for elections, we support the interim presidency of Juan Guaidó.